Plenty of room to move around in open plan kitchen dinning lounge area. Jill & Nev are on site to run the power, pump up the water etc, give any help and advise if you need it on the places to go and things to see, fishing tips, driving conditions, local knowledge. 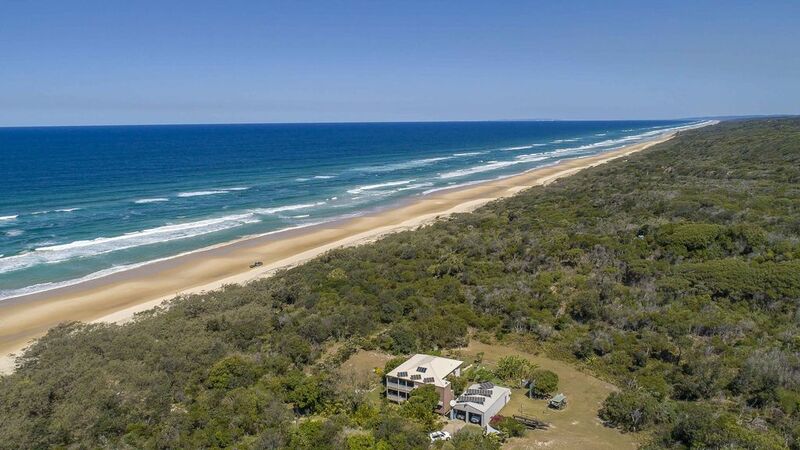 Fraser Island Hideaway is situated half way up the island, hidden behind the first sand dune, surrounded by native flora, a bird watchers paradise.15k from Eurong and only 6K to Happy Valley, fuel, shop, restaurant & hotel. Close to all the wonderful destinations the island has to offer child friendly with lawn & gardens to play in, mini golf course , gate on the veranda for little ones.After 20 yrs a big percentage of bookings are return guests that come every year to enjoy this amazing property . The children enjoying it so much some don't want to leave. A holiday to remember !! The Hideaway is well maintained and cleaned to a high standard for all. World Heritage Fraser Island has crystal clear lakes ,fresh water flowing creeks to swim in, lush rainforests, bushwalking,swimming,fishing,miles of beaches to drive on , sand blows, turtles,dingos, wonderful birdlife and much more.Stroll down the driveway and take a early morning walk ,experience the solitude of the beach.Wake to the birds life and be lulled to sleep by the sea.Whale watching during season from lookout. 100 meters to Beach fishing, walking, whale watching in season. In the garden not on veranda or inside house. Abundant bird life in lush gardens. Fishing at your front door, fish cleaning area. Would not stay anywhere else! This is the best for location and has it all. Jill and Neville are so friendly and helpful. We loved our stay and will definitely come back. Hi Dane, Thank you for bring your extended family to stay at The Hideaway. This accommodation is just perfect. It had everything we needed, was very clean, comfortable and in a fantastic location. Best of all, the hosts, Jill and Nev were very welcoming and made us feel very at home! House is beautiful and so comfortable. A beautiful property with a gorgeous garden. This hideaway had our entire family relaxed and wanting to come back. Jill and Neville are fantastic hosts who made us feel so welcome in their home. Will definitely be coming again. Jill and Nev were wonderful. Even though they lived in the same house you hardly heard from them unless you needed something or wanted to have a chat. The house is soundproofed pretty well as our 6month old baby didnt wake them up. The house is located in a beautiful spot away from all the hustle and bustle. We will be going back again. Thank you Shawn we enjoyed have all of you stay and especially your beautiful baby . I recently stayed at the hideaway with 8 other friends/family. We had plenty of space for entertainment, sleeping etc. The house was situated in such a perfect location to make the most of the island. The caretakers who were staying at the house while Jill and Nev were away were lovely and didn’t mind if we made any noise. Overall, our stay was wonderful and we didn’t want to leave. Fraser island Hideaway is centrally located on the beach between the two townships of Eurong and Happy Valley . Central to all the main attractions. Lakes creeks , rainforest 4WD tracks. . Beach driving. Fishing. Restaurant shops.